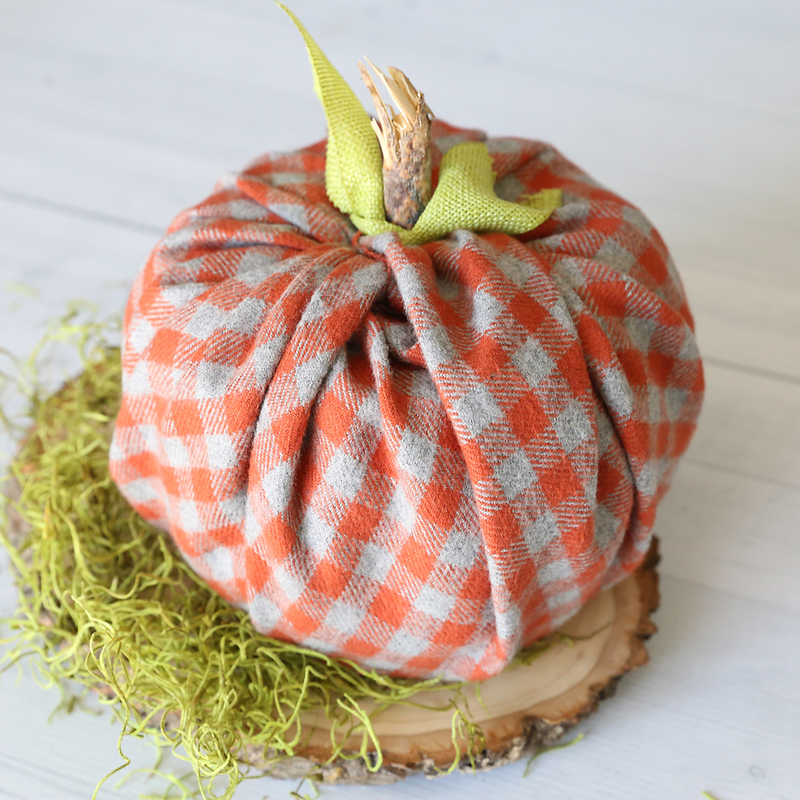 In today’s post: Spruce up your fall decor with these easy DIY plaid flannel pumpkins made with toilet paper rolls. 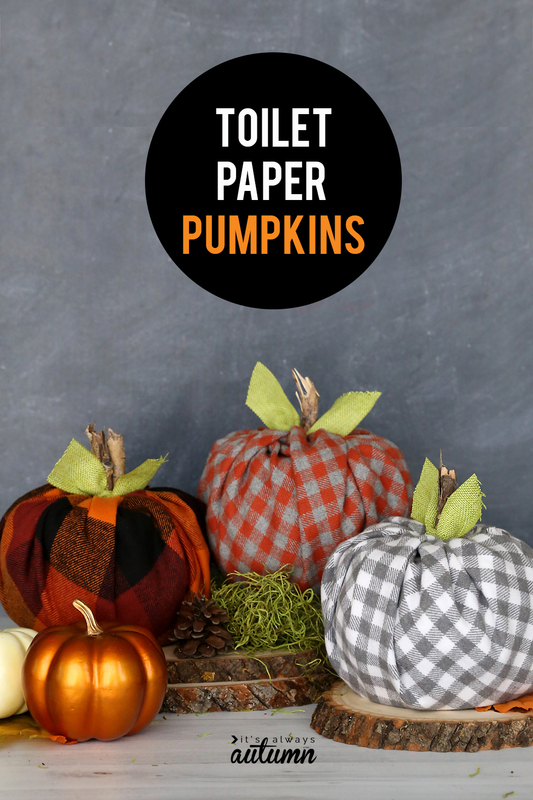 You’ve probably seen toilet paper pumpkins before – this is one of those crafts that’s been around for AGES. I mean, I think people were making these back when I was a kid and that was a LONG time ago. 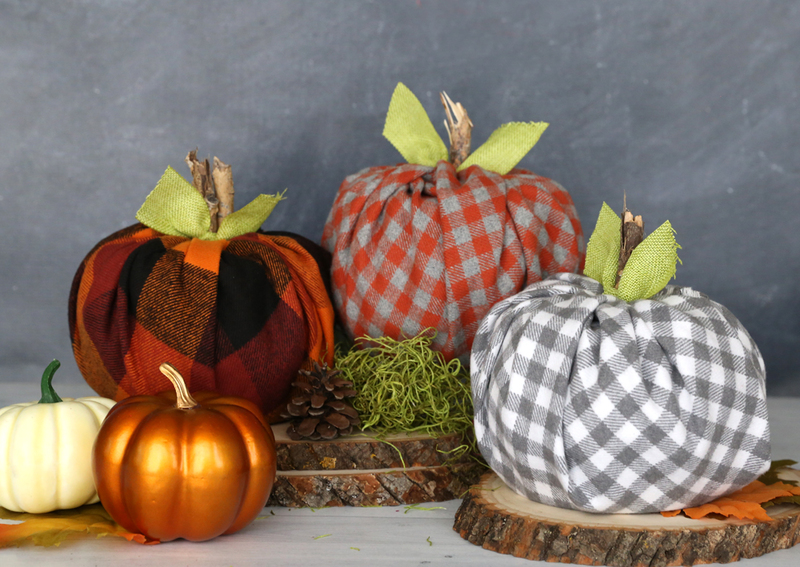 Anyway, I was at the fabric store the other day and saw a collection of gorgeous plaid flannels and decided the good old toilet paper pumpkin could use a little update. A PLAID update. Crafting doesn’t get much easier than this, people. 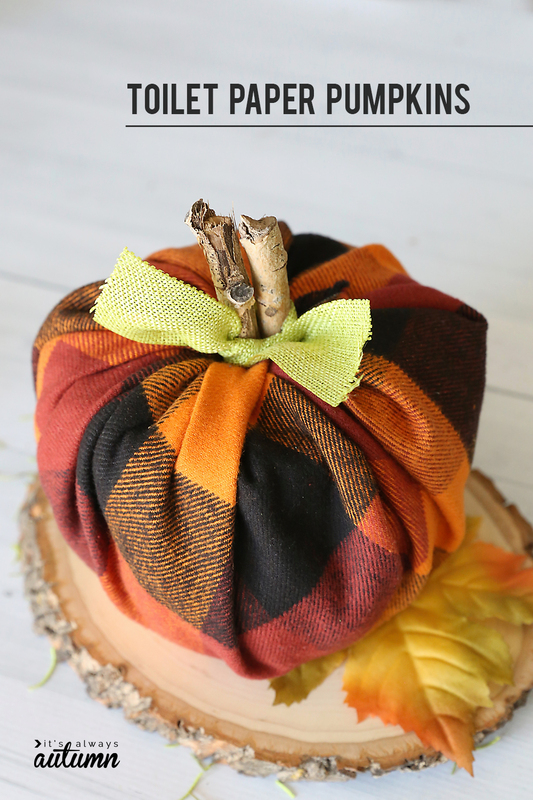 Find yourself some pretty fall colored fabric, wrap up a roll of toilet paper, and stuff a stick in the top for a stem: (pumpkin) mission accomplished. Fabric: you’ll need an 18 inch square of fabric for each pumpkin. 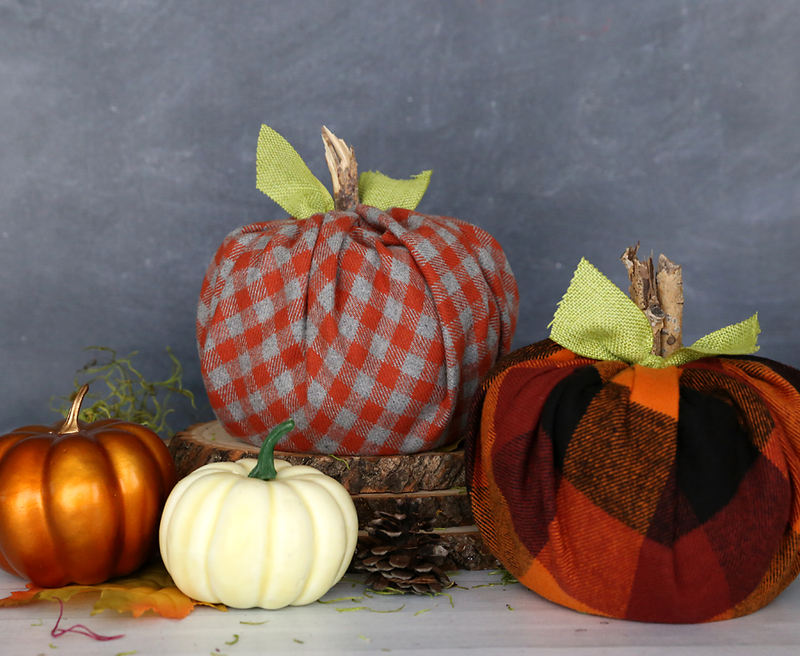 You can buy a fat quarter, which is 18×22 inches, or purchase half a yard of fabric, which will be enough for two pumpkins. I used plaid flannel because it’s soft and pretty, but you can use pretty much any fabric you’d like. Sticks: you’ll want at least one 3-4 inch stick for each pumpkin stem. I just told my kids to find me some sticks last time we were at the park and then I cut them to size. If you don’t want to forage for sticks, feel free to buy cinnamon sticks and use those instead. 1 – Lay out your fabric square. Place a roll of TP in the center. 2 – UNROLL the toilet paper 8-10 times. Then loosely ROLL it back up, twisting and scrunching the toilet paper as you do so. This give you a rounder pumpkin shape. 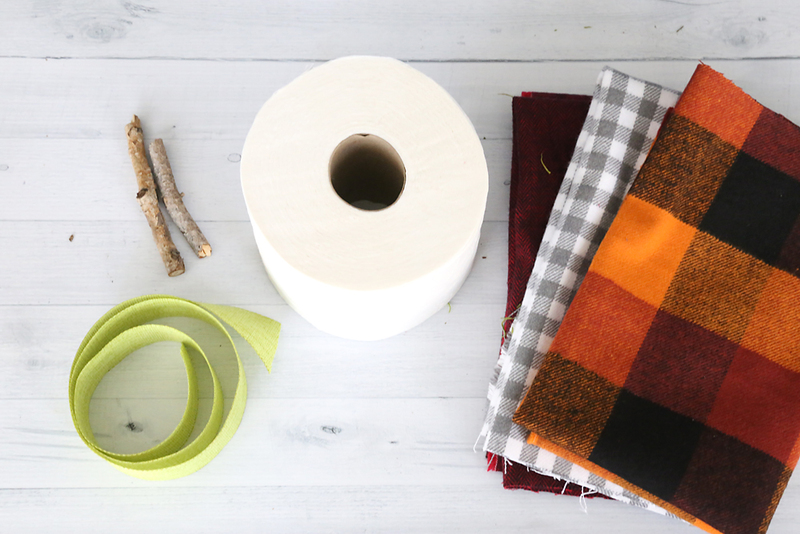 3 – Grab one corner of the fabric and tuck it inside the toilet paper roll, using a pencil to push it down. 4 – Continue with the other three corners, gathering up the fabric as you stuff each corner into the center of the toilet paper roll. 5 – Tie a ribbon around a twig and stuff it in the center of the pumpkin for a stem. Did you catch the most important part of the instructions? Make sure to UNROLL the toilet paper about 8 times, then loosely roll it back up, twisting it as you do so, to make your toilet paper roll a little rounder. This makes the finished TP pumpkins much cuter! Love these pumpkins and it’s just what I need right now! I saw some cute pumpkins similar to this at JoAnn’s today and even though there was a good sale I just couldn’t see paying $5 for a small stuffed pumpkin. Well now I don’t have to! I’ve got plenty of fabric so I’ll be making a few this evening. Love your website! Thank you! This is something I think I can actually do! Thanks so much. I feel out of touch! I’ve never seen these before but they are so adorable! That plaid is awesome! Love this – something I can make with The Grands, while knowing my minimalist DIL won’t be too upset because G’ma stuck her with something more to store – easy enough to take apart and keep the makings in one flat ziplock bag (or hand them back to me), They can even use the tp after Halloween! This is a unique idea and more attractive also very easy. I must try this. SO SO HAPPY U POSTED THIS ! ❤️THank u bunches , loving these and while I’m not the craftiest Grammie I’m going to pull this off with the kids 👍🎉very excited 😆 neighbor kiddos saw it and want to do it too ! Wonderful good instructions and it keeps them out of trouble double win !! I do not have a comment. I just want to sign up for updates. this has to be one of the cutest things I’ve seen in a long time! Going to the fabric store tomorrow! I love the pumpkins..I will be making some. What’s up, yes this article is in fact pleasant and I have learned lot of things from it regarding blogging. I made these! They are so cute! Thank you for the idea! I also used brown pipe cleaners shoved into the center hole and wound them around the pencil to make curly vine looking accents.